Opening date of Kedarnath temple had been read out by the priest in Omkareshwar temple complex, Ukhimath. The opening date of Kedarnath temple in 2016 is Tuesday, May 09. Kedarnath temple opening date has been announced by the priest on the occasion of Hindu festival Maha Shivratri. 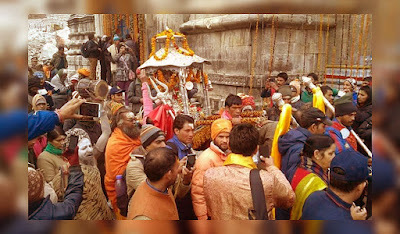 This year the opening door of Kedarnath temple is being seen as very pleasing, prosperous and important as the door opening on the occasion of Hindu festival Akshay Tritiya. Gangotri and Yamunotri temple door also opening on Akshay Tritiya. On 5th may 2016, Shri Kedarnath Doli departed from Ukhimath to Guptakashi for night halt. On 6th May Lord Kedarnath Doli leaved for Phata. On 7th May,2016 Kedarnath Doli departed from Phata to Gaurikund village. next day Lord Shiva Doli reached Kedarnath shrine.On the morning of 9th May 2016, Kedarnath door open to devotees for next 6 months. The opening date of Kedarnath temple in 2016 is 09th May. The Opening date of Badrinath temple in 2016 is 11th May.